JBL BAR series is a whole new range of soundbars | What Hi-Fi? BAR 3.1 has, as the model name suggests, a dedicated centre-channel driver in its metre-long body. The HDMI input count is upped to three, and the subwoofer grows to a 25cm/300-watt device. 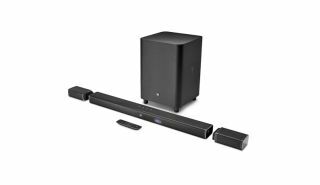 Added to the soundbar's 150 watts, that's plenty of power. BAR 3.1 costs £400.